Could This Be World's Most Spectacular Football Stadium? 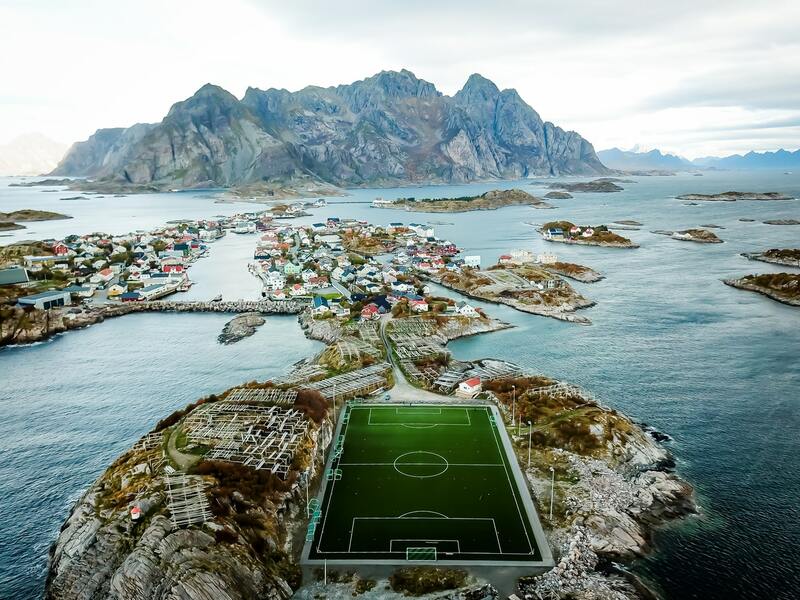 On a picturesque island from the north of Norway there lies a spectacular football stadium. In the small Norwegian fishing village of Henningsvær which is situated on the southern coast of the island of Austvågøy, Lofoten, Nordland, the local football stadium overlooks a majestic natural landscape formed by tall mountains and the nearby waters of the North Atlantic Ocean. Henningsvær Stadion is rather peculiar in that it has no seats and it is used for amateur football. This tiny venue became very popular on the world wide web roughly two years ago when an elevated view of the stadium that was posted on imgur.com gathered hundreds of thousand of views in a record time. In the end, even though this small stadium might not dispose of the same amount of seats or facilities as other prominent football stadiums around the globe (as a matter of fact, it’s no way near such names as Camp Nou in Barcelona or Anfield in Liverpool given that it has no seats at all) these bewildering views in its proximity will certainly stun each and every footballer (be them amateur or professional) and many football fans out there!